any MIDI Guitar or Keyboard! Wireless MIDI available on all units. 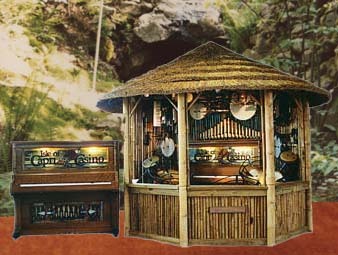 Our 52 piece acoustic MIDI orchestras with congas, agogos, timbales, claves, guiros, bongos, Vibra slap, drums, crash cymbals, etc. 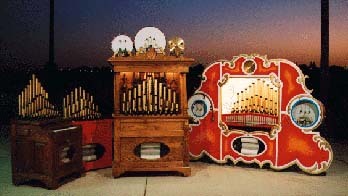 Player piano and nickelodeons, carousel organs, bandorgans, calliopes, preassembled kits or ready to play. 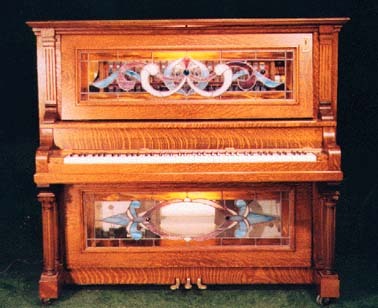 Player piano and nickelodeon conversion kits for any piano. Player piano rolls for orchestrions. 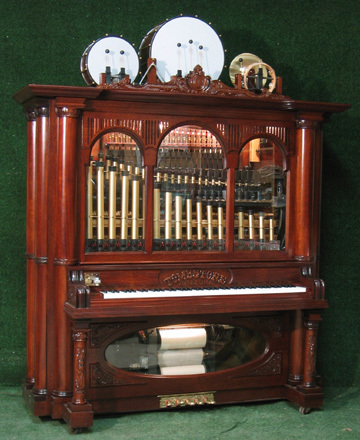 We buy, sell and restore music boxes, monkey organs, player piano, carousel organ antique instruments such as seeburg, coinola, Regina, Duo-Art Steinway player grands. 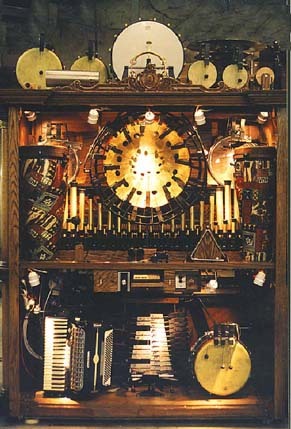 Miniature MIDI valves, signal processors, replacement parts for Ragtime player pianos. 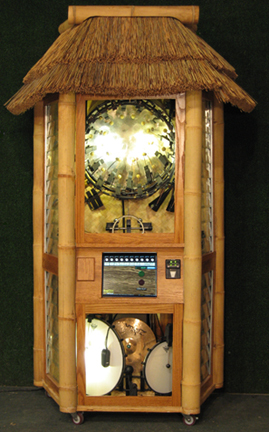 Digital Jamaican Steel Drums! 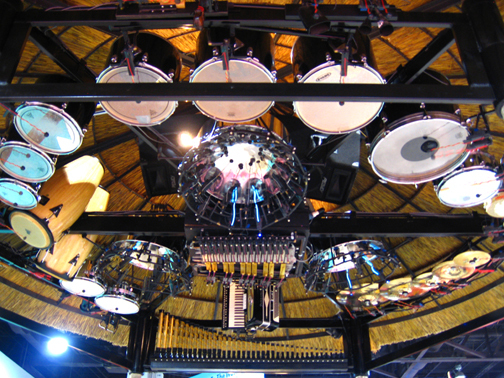 MIDI conversion of roto toms, drums, cymbal, tambourines, triangles,Indian wood block, castanets, flute pipes, violin pipes, etc. General MIDI files. E-mail us for a free brochure and to be on our mailing list. Send $15 for a color catalog to: Ragtime, 4218 Jessup Rd. Dept. WS, Ceres, CA 95307 For service questions please consult the video service pages below. If you don't see what you are looking for feel free to email Ken at ragtimewest@earthlink.net and he will send you a link or see that a video is uploaded to suit your needs. For product purchases and questions call Ken at (209) 735 0767 Skype Call (209) 735-0767. For parts and train whistles Monday through Friday 7am - 4pm call (209) 634-8475 or Email us at ragtimewest@earthlink.net. Click here to go to the Ragtime Movie Demo Page - Excellent Mpeg files! 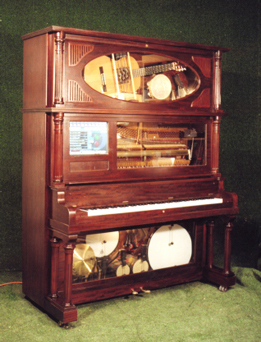 The Ragtime Miscelaneous Videos Page. The Ragtime YouTube Factory Tours Page. Ragtime Product and Service Instructionals. Listen to the roll before you order! The Ragtime YouTube Trade Show and Convention page. 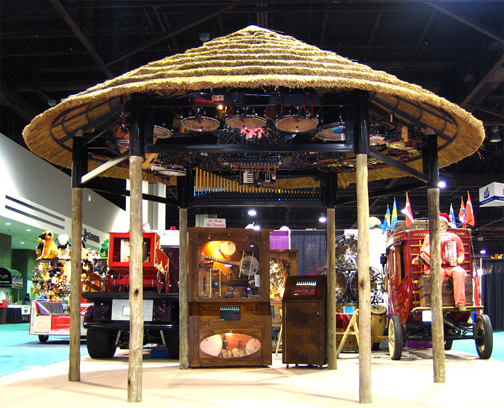 Setup for display at the IAAPA amusement park show convention in Atlanta, Georgia Nov. 13th-16th, 2006. 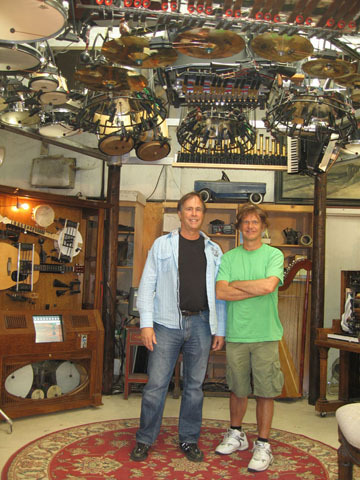 It is a good example of what to expect when the instruments are mounted above the floor. 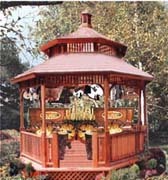 This unit will be setup on a beach where a bar serving drinks will be placed below. It will be fitted with weather proofing clear vinyl siding which will roll of in good weather. Also, the bar can be moved back and a dance floor revealed. 16ft wide. Most of these photos were taken from the floor looking up at the cieling where the instruments are mounted. 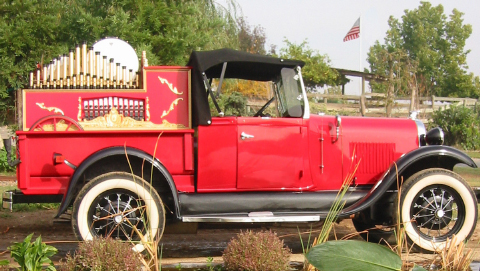 This Model A shows off our BW66m band organ very well. 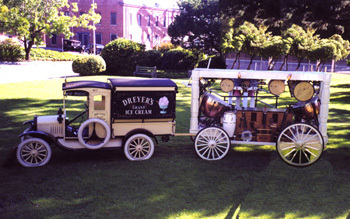 Ask about our custom parade vehicles. 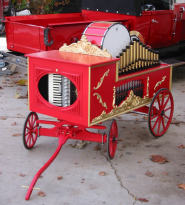 This little band organ is on metal spoked wheels with rubber tires. It can be pulled in parades without the truck. Click here for a YouTube video of the above playing "TotalRecall". 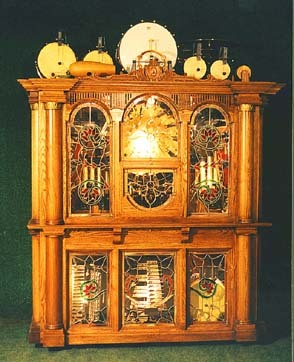 A good example of the Automated Kettle Drums which play a range of 14 notes. Good enough for Lord of the Rings film director Peter Jackson's home in Wellington, New Zealand. Unbelievable sounds and MP3 files are available on our MP3 page. 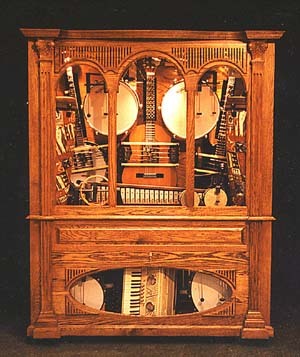 Plays 47 percussion instruments with Bass Guitar, Guitar, Banjo, Flute Pipes, Accordion, Bells and Piano. Sounds great with rock, classic, blues, jazz and many other music forms. Click for YouTube of Peter Jackson's comment, "proud have the first Ragtime Automated Band in New Zealand". 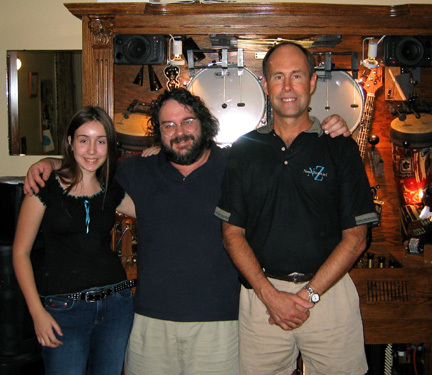 A photo of Ken and Jamie Caulkins with Peter Jackson in his home in New Zealand. A gracious host, here is Peter Jackson presenting Jamie Caulkins with the Elfin Star, the Elf symbol of immortality. 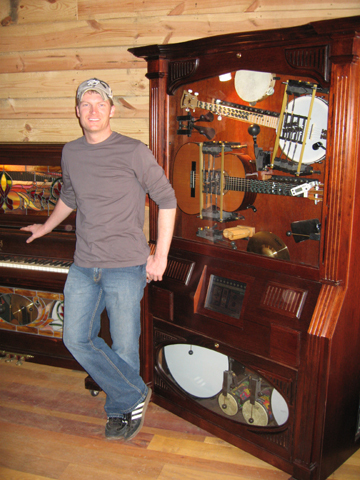 and his Country Special and Piano for his private saloon in his private Old west Town on his estate in Mooresville, NC. 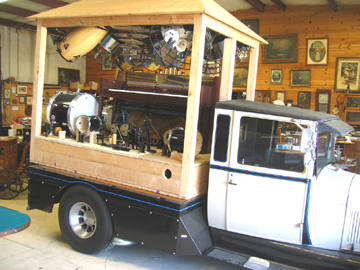 This is our Band Organ mounted on a Hot Rod Flatbed truck for Parades. Used by Coca Cola in Brazil for Carnival. 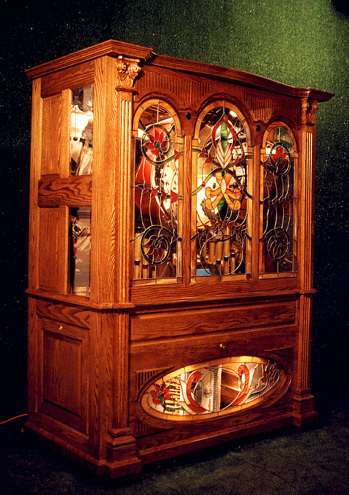 Grade 3 Solid Oak Cabinet on left, Cherry in Center. Wonderful! Our Bluegrass Special. Must be seen in person. Moret MP3 files are available on our MP3 page. Plays 15 percussion instruments with Bass Guitar, Guitar and Banjo. Sounds great with rock, classic, blues, jazz and many other music forms. Click on one of the song titles below to hear it play an actual recording of it playing on MP3 format. Great for your saloon. 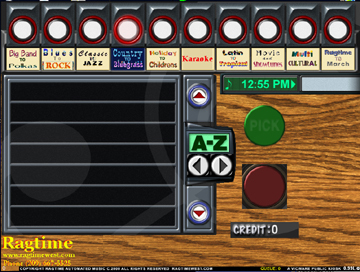 Touch screen available with our special jukebox program, screen shown below. Selections automatically picked from Sub Folder names within Juke Box folder. Scroll Aphabetically within folders. Great for organizing MIDI, MP# or MPEG files for instant access. Also will work for pre recorded announcements. Great for many applications. Holds more than 20,000 songs on an average hard drive. Coin operated or Free Play. Works with Serial contolled Bill Acceptors and Electronic Coin Mechanisms. Big Bertha on the left and Little Bertha on the right. 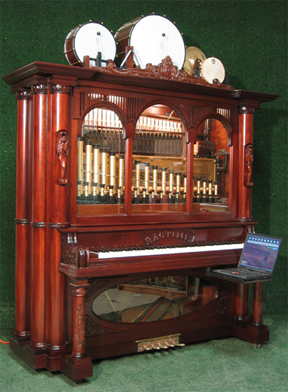 Little Bertha orchestration orchestrion. Below it is playing Hot Hot Hot. 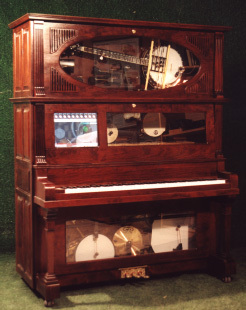 I take both the front and bottom panels off so you can see the instruments playing better. Click Here for the above playing Dayo in stereo 1.4 mb - 66 seconds - allow 8 minutes to download. Be sure to get on our Mailing list for sales flyers and new product info. 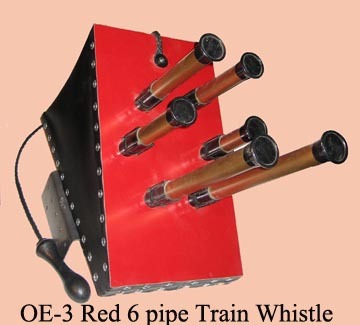 Click on the Photo of the Train Whistles below to go to the parts page. 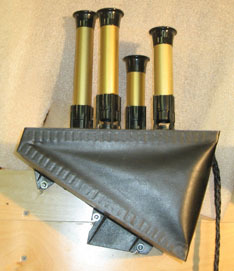 Mounting Brackets included for all Whistles. The OE-3 mounting bracket may be on the right or the left. 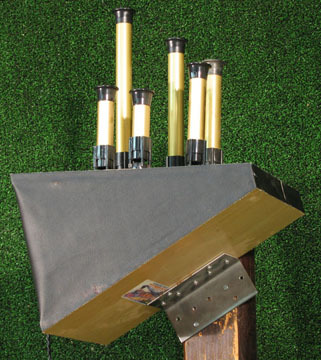 The SE-1 mounting bracket is fixed on the right side of the Whistle body. Rope and handle included. Please contact us for Wholsale quantities of 12 or more. 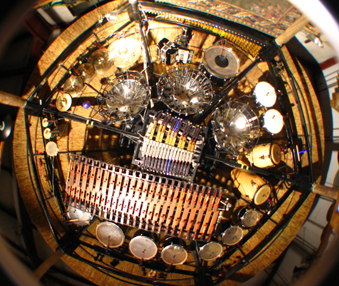 Automated musical orchestra instruments controlled by your computer! Misc. 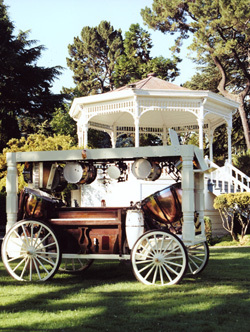 Antiques, Music boxes, old cars etc., watch for frequent changes. 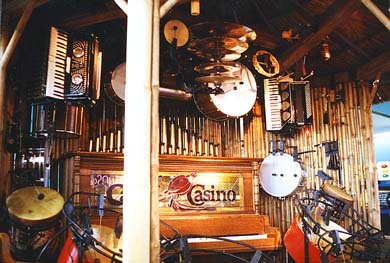 Until this summer this was at Isle of Capri, Lake Charles, LA - as a permanent attraction, now in the process of being moved to Las Vegas to be set up in the Lady Luck Casino following reconstruction. Most likely in September, 2001. You can see another one at Piscilago Waterpark just out side of Bogata, Columbia. 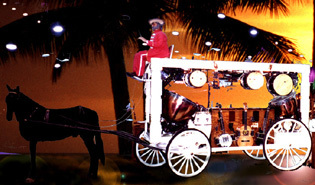 It is the center attraction at the main gate and is complete with two moving robot Columbian men as well as a guitar and bass guitar. 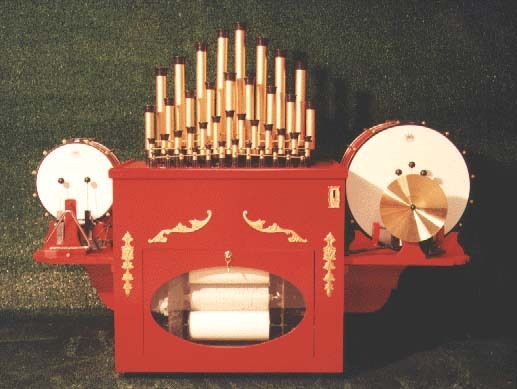 Click on picture above for a sound clip of our small band organ Click here to go to the MIDI Guitar page. 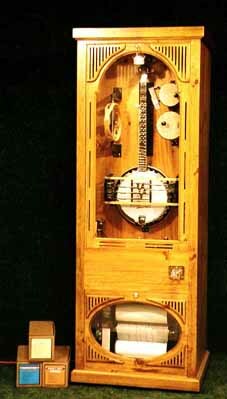 Click here to go to the Roll Operated Banjo page. The cabinet to the right is known as the Morena. 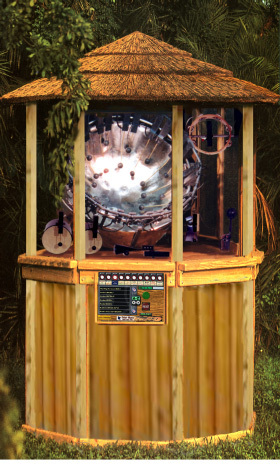 Click here to go to the MIDI Steel Drum page. This Little villa contains a MIDI operated accordion. It contains Bass Drum, Snare Drum, High and Low Bongo Drums, Snare Drum and Tambourine. Touch screen and Bill acceptor is standard. Click on a song below to download an MP3 of it playing. 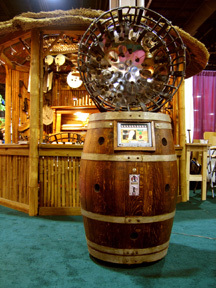 Great for Italian or Mexican Restaurants, not to mention Octoberfest! Click for an MP3 of the above playing "That's Amore". 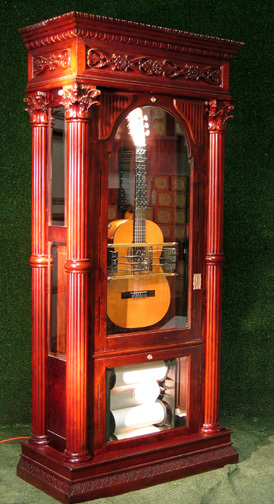 Download this mpeg movie to see how easy the Ragtime Automated Guitar is tuned with it's automatic tuner, click here. The Banjo is just as easy. The String notes are printed at the top of the neck. 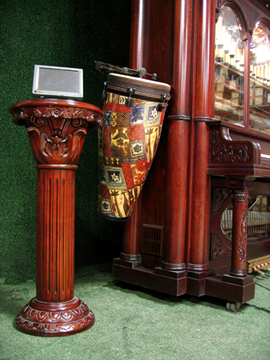 Click here to go to our Style Z roll operated Web pageThis is our MIDI Zm-GRP with pipes, glock, piano and drums. The laptop pivots out from beneath the keyboard. Carving is extra. A touch screen panel may be installed in either top glass panel along with a coin op, or bill acceptor. Click here to go to our Guitar/Piano and Banjo/Piano page. 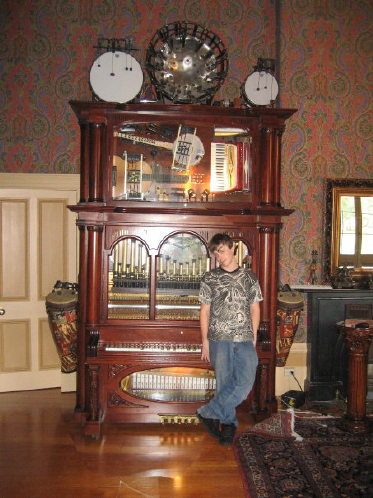 Seen here is my son Jeff with our largest cabinet style Orchestrion. 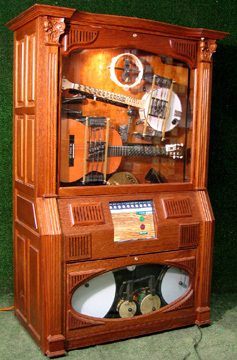 It is a MIDI Zm-AbCDEGJKPS with guitar, banjo, bass synth, pipes, glock, piano, accordion, Steel Drum and drums. 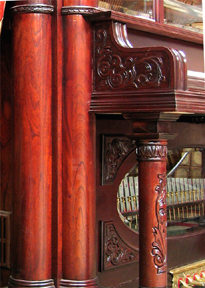 The PC is located within, but a matching pedestal with touch screen is optional. Without it you may use your own PC or any MIDI player. Available in Cherry and light or dark Oak. Carving, as shown, is optional. 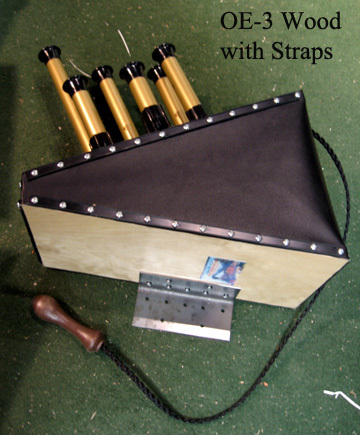 There is one of these in Stock at the Ragtime Australia store near Brisbane, Australia. If you love what we do, do not have the room but would like to support our research in the field of Automated Music feel free to follow the link below to donate. Your contributions are both needed and welcome. Bid with confidence, considering our perfect 100% feedback on 1500+ transactions!